I think most of us are probably in agreement that Christmas stuff hits the stores way too early. I don’t even want to think about Christmas until Thanksgiving has passed. Even in those instances where I ponder the idea of being one of those people who does their shopping way ahead of time, I know I never will be, in part because I could never get my act together in time, but also as opposition to all the crazy Christmas marketers. That being said, I’m going to come across a little hypocritical, because I am ready to talk about Christmas baking. These aren’t Christmas cookies. In fact, I made them in October, but when I made them I couldn’t help thinking they’d be pretty on a tray of various Christmas cookies. I used two different jams for the filling (raspberry peach and blood orange—thank you Paige! ), but you could use whatever your favorite is. 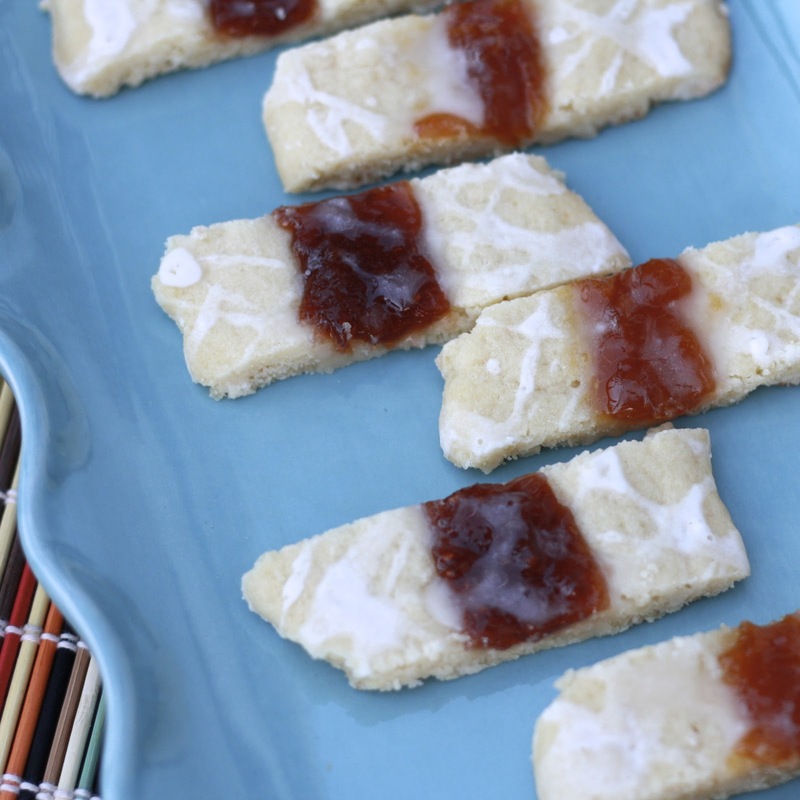 The cookie part is a cross between shortbread and sugar cookies in both flavor and texture. Jam-filled centers provide aesthetics and a “bit of excitement”, as Ryan described them. These stayed fresh for several days, making them another good choice for Christmas baking, and you could probably freeze them between layers of wax paper if you’re avoiding the Christmas-decorated stores and would instead like to get a head start on your holiday baking! Commenter #3 Brenda F who said "Monday is my first day back to work after being off for 3 mo with my 4th child. I can't think of anything that could cheer me up more than cookies!" Commenter #20 Ashlyn who said "I literally just found out I work all day on Thanksgiving. Going into depression. Need cookies." 2. In a large mixing bowl, cream butter and sugar for 3 minutes, until light and fluffy. Add egg and vanilla and beat well. In a separate bowl combine the flour, baking powder, and salt. Gradually add to the creamed mixture and mix well. 3. Divide dough into four equal pieces. Shape each into a log, about 8 x 2 inches. Place each log a few inches apart on parchment lined baking sheets (I did two sheets--two logs per sheet). With your finger, make a 1/2-inch depression down the center of each log. Bake for 10 minutes. 4. Remove from oven and fill depressions with jam. Bake for an additional 10-15 minutes, until lightly browned. Allow to cool on baking sheets sitting on wire racks. Once completely cool, cut into slices with a pizza cutter or a knife. 5. Whisk glaze ingredients together in a small bowl and drizzle over cookies. 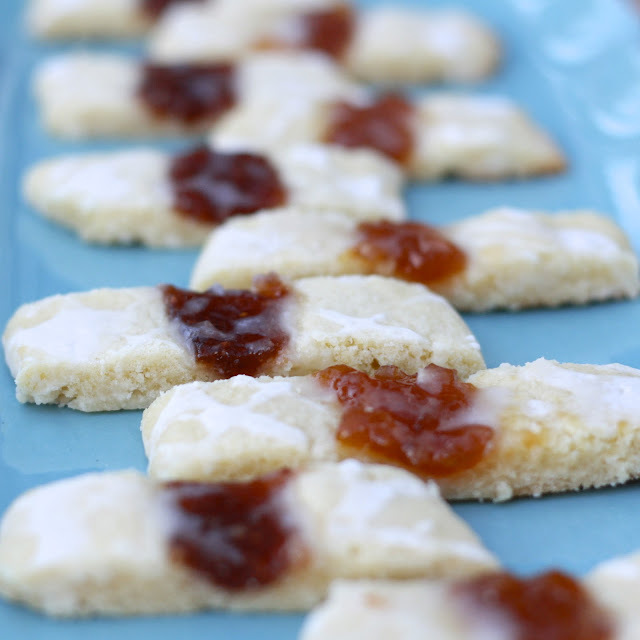 Allow glaze to dry completely before cookies are stored in an airtight container with layers of parchment between them. (I prefer to store the container in the fridge). Cookies will keep for 4-5 days, and would also freeze well.